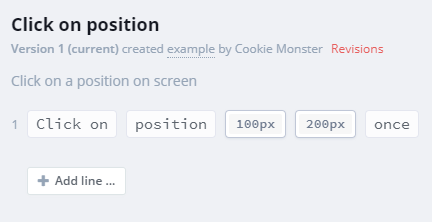 Click on a specific element or position on the web page. The element is clicked on in the center of its bounding box. 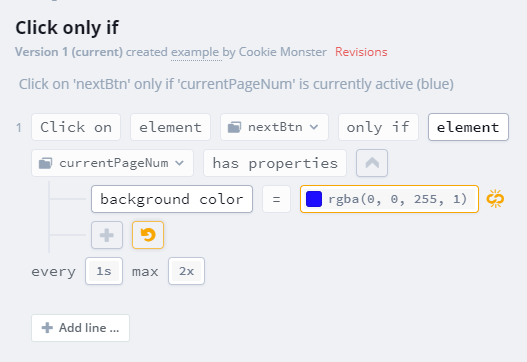 If the element is obscured by other elements the Click on command may not work as expected. To click on a specific position, specify the coordinates in pixels relative to the top right corner of the web page. You can send repeated clicks to the same target with a particular frequency. For instance you can perform double clicks, or check if the web app can gracefully handle frequent clicks. You can combine the Click on operation with an Assertion and instruct Suitest to keep clicking on the target until a specific condition is met. You can combine the Click on operation with an Assertion and instruct Suitest to run this operation only if the condition is satisfied.